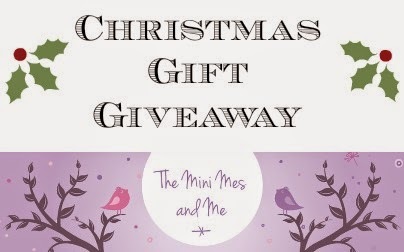 This prize is provided by me, personally, and it's a mix of beauty and baby goodies - perfect for a new mum for a bit of a pamper or split up into several gifts. Unfortunately the previous prize was withdrawn by the PR company after it was arranged, written and scheduled so I'm digging into my own pocket last minute to fund this one! How good am I. For your chance to win this bundle of goodies you can enter via the Gleam entry form below. I need a mini you to put on the top of my tree this Christmas because I think you are a star! Thank you so much for your lovely blog and all the giveaways you do - not just at Christmas, but throught the year too! Your prizes are going to make many of your winning followers very happy this Christmas! I hope you and your family have a wonderful Christmas and 2015 brings you lots of happiness, good health and luck too! Happy Christmas to you and yours, and here's hoping next year is a successful one for you all! Hoping you have a fabulous Christmas! thankyou for running these fab comps - getting us all excited ready for christmas; i hope you all have a lovely christmas, we are super excited because it is my sons birthday on dec 5th, then christmas and hopefully providing wriggly doesnt decide to put in an early appearance, we then are due baby at the end of january, so a busy fun packed couple of months!! Would love to win as new baby coming into the family soon! thanks for such a brill site and great comp! Hope you and your family have a wonderful Christmas and New Year and keep up the good work. Hope you have a wonderful Christmas - you deserve it for all the hard work you do over the rest of the year. Also, I've had a word to Santa & he's promised to call in & leave something nice for the little ones!! Don't be too ambitious for the New Year, it's going to be a brilliant 2015 for you!! Wonderful blog, thank you and the plush is so cute. Merry Christmas to you all, I hope 2015 bring you all you wish for. Merry Christmas to you & yours Emma. I hope Santa is good to you all & you have a peaceful & joyful Christmas. Thank you so much for the fantastic Christmas Giveaway. Merry Christmas to you all hope you have a great Christmas and thanks for a great blogging year. Have a great Christmas. Would love to win this with a new baby on the way. Wishing all the minis a very merry Christmas and a happy new year!!!!! Thanks for the lovely competition and happy christmas! Thank you for all your fantastic competitions and the time you put into making this a great site. Wishing you all a very merry Christmas and a prosperous, healthy and happy New Year.